I was looking for UK census information from 1801 for my research paper. In England and Wales 390,127 people (almost 0.8%) stated their religion as Jedi on their 2001 Census forms, surpassing Sikhism, Judaism, and Buddhism, and making it the fourth largest reported religion in the country. Haven't posted in a long time so it seems like there should be news. Its been pretty much just school lately. Ingrid did (VERY) well in her recent debate tournament. Aside from that, umm... I've been helping out in a light way preparing for this year's STM Historic production. I painted some sweet shields for it, and if any of you are planning on buying tickets, please talk to me soon and I can hook you up. It should be a great show this year. The show is on the 25, 26 and 27 of this month. I'm going on the Sunday (27th) if anyone wants to come on the same day. "This is the Saskatoon Public Library. Material requested by a member of your household whose name is spelled: P-H- >click<"
This is what it has always sounded like. This is how it has always been. Constant as the evening star. But today was different. Today I was greeted by a different voice. A different message. "Hello, this is your public library. Our records indicate that you have materials that are now past due. Please return them so that others can use them. Philipsiemens." First off, this has moved from friendly and neighbourly to distant and machinated. Was it so hard to include the word "Saskatoon" in it? Now we are bombarded by a pleasant female voice that nonetheless delivers a much more chilling message. "We are no longer people." The library has become part of a massive conglomeration that is too busy to personalize its messages BY CITY. In the past, the voice on the other end would meticulously (if mechanically) spell out each and every letter of our names so that we would know who the message was for. Now, in what was possibly an attempt to sound more thoughtful, they generated the entire name but although we as a species have managed to invent some pretty convincing simulated speech programs, this one sounds like a rushed afterthought tagged on to the end of the message. On top of that, instead of simply waiting until hearing the first two letters of our names, we are now forced to listen to the entire message before we learn who it pertains to. I feel like I was playing catch with one of my friends and while I wasn't looking, he was replaced by someone else who doesn't know me at all. But I GREW UP with that other guy! He was a part of our family. And if he is to be replaced and killed, at least he will receive a eulogy. Farewell my friend. P-H-I-L-I-P will miss you. P.S. I still love you, SPL. Those little key-chain bar-code cards were a great idea! Selling your soul = not so much. So, I'm still excited about Russel Crowe's Robin Hood movie. This has caused me to think of other Hoods in the past and how they have measured up. So here, in roughly chronological order, are most of the Robin Hoods that I have encountered throughout my life. Please let me know who you think the "real" Robin Hood is! Who is the real Robin Hood? Don't know who these are? Let me help you! Some of you may know that my ipod broke around a year ago. I took it outside with me on a cold day and for some reason it just died. So today, on a whim, I decided to try it in my new computer to see if it works. It does. Maybe it just needed some time to rest. Anyway, I have my ipod again. That's pretty sweet! I am joyful and thankful. It is a good day. I believe that was the toughest set of finals I've ever had to deal with. Not so much the finals, actually... Its the term papers that got me. 45 pages of term papers followed by three finals on the same day (I got one of them pushed further, thankfully!) made for a very stressed, tired and unhappy Philip. But all is forgiven, for now I am FREE! Wow, this feels good. Whoohoo! then I'm your man! Some of you might find some of it actually interesting. I actually would have ENJOYED writing a couple of these if I had more time. Putting all of that work into these topics really makes me interested in them. Whew! I shall enjoy this break, that's for sure! And for those of you who have been sadly neglected for these last few weeks, I can live again! Huh... I never questioned the rumour that an actor died in the production of Ben Hur. For all those who I shared that information with, it turns out to be FALSE. All of the death scenes in the chariot race scene were cleverly used dummies and no one actually died. The EARLIER silent version of Ben Hur in 1926 did in fact include a fatal chariot crash but not the one we all know and love. We can all rest assured that most of the injuries incurred in that movie were sunburns. Fancy that. So today was interesting... While practicing some fight choreography for an upcoming... event... 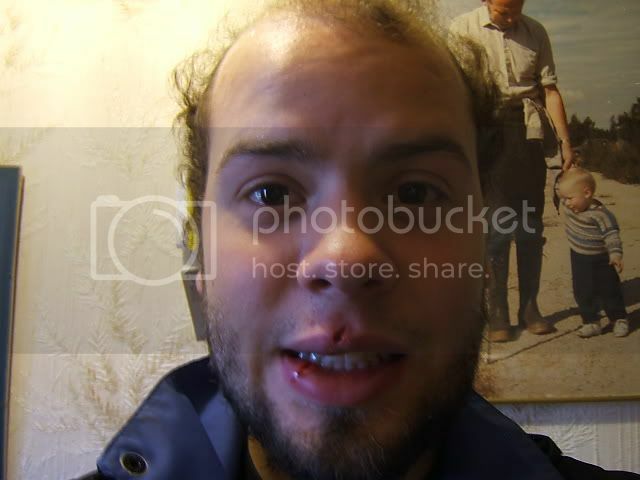 I managed to trip in the leaves and got sliced right across the mouth with a sword. Nice one Philip. So now I've got a fairly split lip that (thanks to the wonders of sewing) will probably not end up scarring too much. Oh well. Maybe next time. 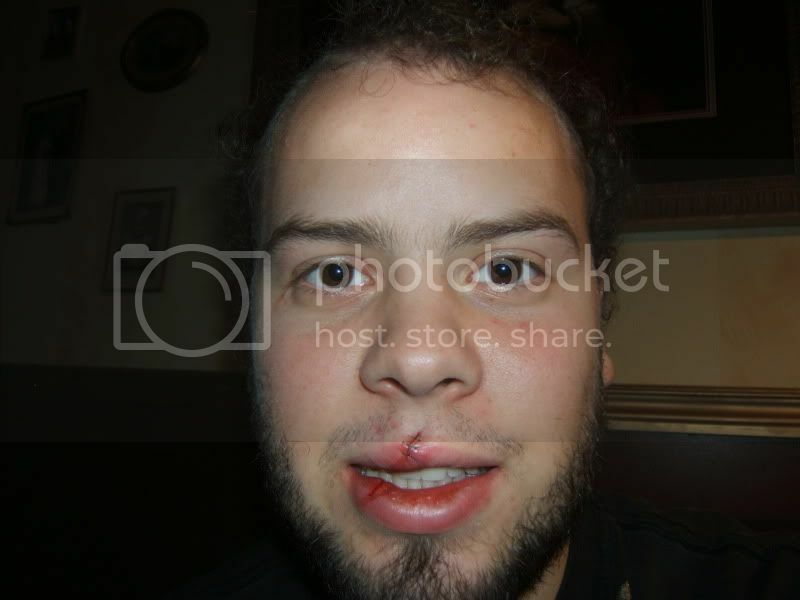 In the end, we decided that the bottom lip is not in need of stitches and will heal well enough on its own. Anyway, i am glad that I had a chance to reconnect and put in some honest hard work again. Now its back to lifeguarding for me.